at the Newark Cathedral in June 2010. 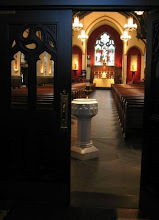 In accordance with the Apostolic Constitution Anglicanorum Coetibus, the Congregation for the Doctrine of the Faith has today erected for the United States a Personal Ordinariate for Anglicans who desire to be received into full communion with the Catholic Church while preserving their Anglican patrimony. This new pastoral structure is titled after the symbol of the authority of the Bishop of Rome to teach, sanctify and govern as pastor of the universal Church: the Chair of St. Peter. The first Ordinary is Father Jeffrey Steenson. Until his reception into the Catholic Church in 2007, Father Steenson was a bishop in the Episcopal Church and had previously served as rector of several traditional parishes in the Episcopal Church, including the Church of the Good Shepherd in Rosemont, PA where Father George Rutler has once served. This is but another step in the long process of trying to gather together small groups of Anglicans, both clergy and laity, who desire to become Catholics while retaining their corporate identity as parishes in this new Ordinariate -- essentially a non-territorial diocese. Anglicans anywhere in the United States who desire to be received into full communion with the Catholic Church and preserve their corporate identity should now be in touch with Father Steenson. The new Ordinariate website is at www.usordinariate.org.